I got interested in Japan when I was 17. I made friends with a Japanese girl who was visiting Vietnam. We became pen friends and I started to study Japanese because I wanted to understand more of what she was saying. We're still good friends today. That's really nice. Japanese culture made inroads into China early on and the TV dramas starring actress Momoe Yamaguchi were popular among my parents' generation. 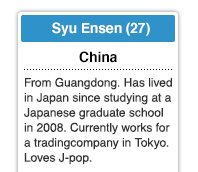 I really got into J-pop when I was 12, and that made me want to know more about Japan. I'm off to a Morning Musume’s concert today. I got interested when a friend of mine told me about Japanese pop culture. I liked the anime "Gin Tama" and would watch it very often.